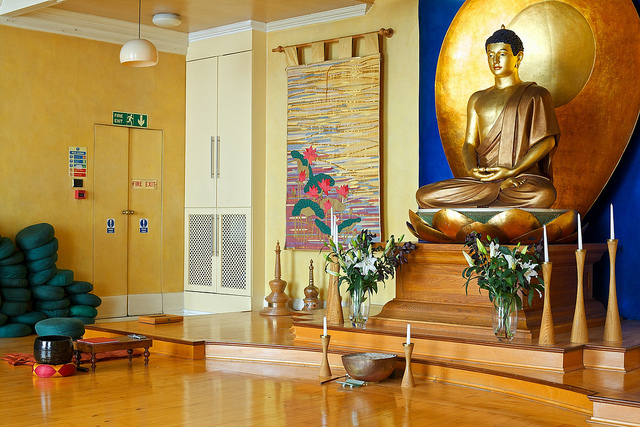 This is the main shrine room at the London Buddhist Centre. There is much discussion about the role of ‘secular’ mindfulness and Buddhism. Last Friday evening, after a day at work, I popped down to the London Buddhist Centre. Every Friday evening, from 7pm, there is a class. It is a time for a meditating in a group with minimal if any instruction. Essentially the evening involves one practice from 7:30pm to about 9:45pm. It is divided into three parts: two meditations and a Puja, a ritual to cultivate and express particular qualities, such as devotion, joy and compassion. Between each part is an optional short break of a few minutes, to stretch the legs. On arrival, I had noticed the impact of having had a busy ending to a very busy week. Yet, through the practice, I noticed an overall deepening into ‘being’ and related unfolding ephemeral processes. It became easier to notice the arising and passing of mental events and beyond this, a contextualising quality of spacious, empty, unbounded, joyous awareness. On the journey home, in my thoughts arose a clear solution to work-related issue that I had been grappling with for months. 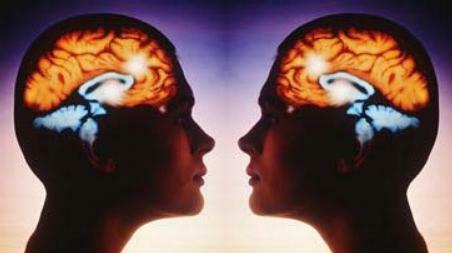 A new type of neuron–called a mirror neuron–could help explain how we learn through mimicry and why we empathize with others. Consequently, this week I found myself reflecting on various aspects of mindfulness practice, including the benefits of group practice, the impact of the context in which one practices and the intention on brings to practising. Group practice provides support, encouraging and enhancing a richer, felt sense of being, possibly evoked by the mirror neurons in the brain, stimulated by still presence of others to replicate a deeper stillness within. Further to this is the meaning that the context brings, a symbolism that resonates throughout the practice itself. Overall, I concluded that the intention, whether expressed consciously or not, is key to influencing the direction of creative expression and that mindfulness practice is essentially a creative act. This entry was posted in Uncategorized and tagged buddhism, consciousness, creativity, experience, experiment, intention, LBC, mediation, mindfulness, mirror, neurones on Apr 29, 2014 by Holistic Education.